Mumbai, 8th May 2014: Oriflame India, unveiled their first range of easy-to-use, crème based hair coloursamidst much fanfare at the heart of commercial hub in Mumbai. The eventful evening also saw the introduction of Oriflame India’s Hair Expert, Ms. Pallavi Sehgal. The day was Oriflame’s ode to hair care and styling. Apart from relaxingpampering sessions to intriguing hair make-overs, the audience also introduced themselves to the worldof hair colours with live demonstrations, tips and tricks to attain lustrousand gorgeous tresses. For radiance that lingers, nourishment that rejuvenates and colour that makes a lasting impression, Oriflame displayed the OriflameHairX TruColour range of tantalizing, mesmerizing hair colours. Six lively hair colours seamlessly match the Indian skin tone and make one swoon over glossy, lively radiance! Available in stunning shades of Black, Dark Brown, Blue Black, Deep Mahogany Copper, Intense Brown, Mahogany, the colours unravel the goodness of rich, smooth cream formula that penetrates and conditions hair for intense colour and ultra-chic shades that fall with radiance. At the occasion, Oriflame India’s Marketing Director, Ms. Sharmili Rajput, elaborated on the brand’s entry into the new segment of products, ‘In our ceaseless endeavour to meet the diversified needs of our consumers, we have forayed into the hair color segment. 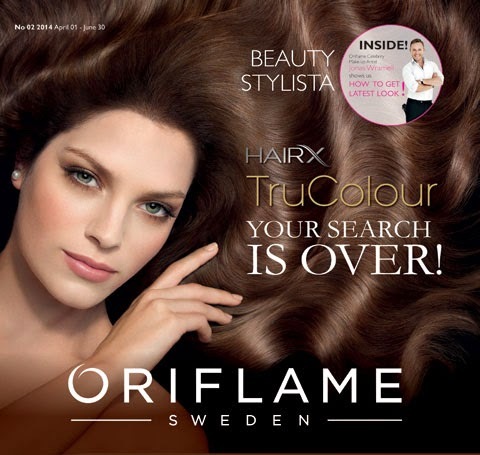 Oriflame’s HairX TruColour is a product that has been customised in accordance with Indian tastes and preferences. Thanks to the riveting shades in the Indian portfolio, we look at steadily gaining a considerable share in the hair color segment. With this launch, we would also like to welcome Pallavi Sehgal as our Hair Expert. Pallavi showcased the radiant results of Oriflame’s hair colour to the audience. She also enriched the attendees on the latest trends in hair care and styling, while Ms. Sharmili Rajput delved into the existing hair colour market in India. The event was witnessed amusical turn witha performance by renowned singer and composer, Gaurav Dargaonkar. The audience, raptured by his lively tunes, swayed on to his magical compositions and revelled in the glow of the iridescent evening. Oriflame HairX TruColour is available in 6 lively shades of Black, Dark Brown, Blue Black, Deep Mahogany Copper, Intense Brown and Mahogany.The pack comprises a colorant cream gel, developer, Post treatment gel.